I mentioned last time that I had managed to fit in a trip to the Colinette Mill Shop in Llanfair Caereinion. I was rather disappointed last month that the chicken-pox that curtailed our Welsh holiday also put paid to my annual trip to Llanfair, but I managed to find an excuse. My boss left here last month to be made Vicar of a Parish not far from there and I managed to get over to his installation/induction/whatever highfalluting term the church came up with this time. Suffice it to say that at the beginning of the service he wasn’t the vicar and by the end he was. The morning after the service I was up, packed and ready to go in time to get over to Llanfair for opening time. I had about an hour before I really had to be on the road in order to drive 220 miles or so for a dentist’s appointment. 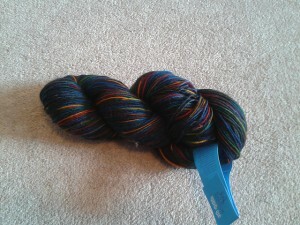 This was yarn shopping with purpose, focus and no time for distraction… or so I thought. 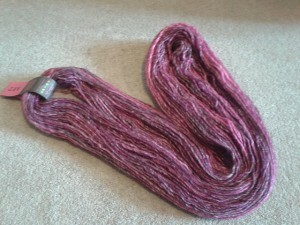 It’s called Cherry and is just on the dusky side of pink. I vetoed the really, really bright pink that the lady was trying to persuade me to get. Now, I was in a yarn shop so, obviously, I bought sock yarn. 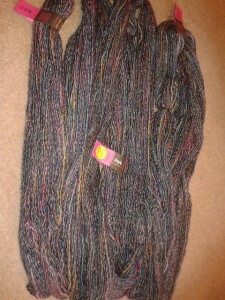 Just a skein of Jitterbug that is destined for Christmas socks for my lovely husband. 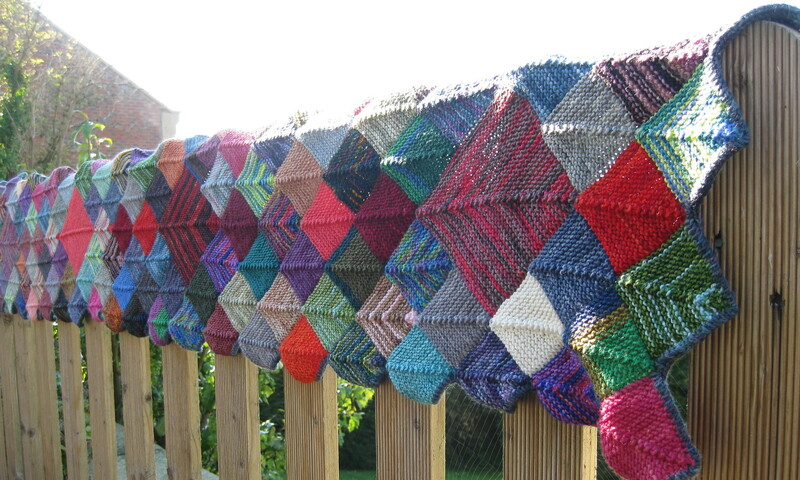 I’ve never yet made him knitted socks (or indeed knitted anything else to wear – I don’t think a tea-cosy counts) and I think a pair of his own might increase his enthusiasm for the concept of knitting. Finally, and here is where you may have to take a deep breath, I went into the sale room. Everything in the sale room is sold without ball-band, presumably so it can’t be passed off as the real thing. Some yarn, however, is fairly easy to identify and I was struck by a whole shelving unit with various shades of what looked like Hullabaloo. 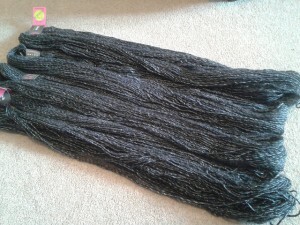 I checked with the shop lady and she confirmed that it was, indeed, Hullabaloo – quite a thick wool including one ply of wool from welsh black sheep. 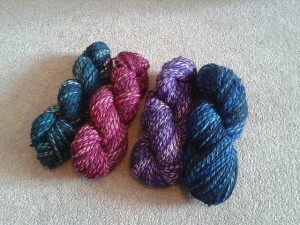 I’ve used it before – I bought 4 skeins last year in fact, although they have all gone now. 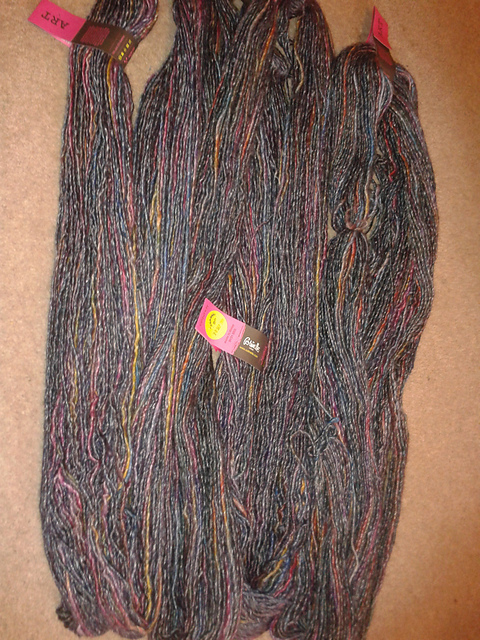 They were on sale for £5 a skein, although they were in the main shop for (I think) £5.17 a skein. A discount is a discount, right? I looked more closely: the skeins in the sale room were 100g skeins and the ones in the main shop were 50g. Less than half price = result! I’m fairly certain that at least two of those are the same shades I bought last year. I have no idea what they are going to turn into, but it is going to be fun finding out. That’s the lot. You know it has been a good shopping expedition when the cashier takes a deep breath before showing you the total. I was also going to write about the selection of a pattern for a pair of gloves today, but I think I’ve written enough for now. Also next time there will be another finished object and possibly a photo of a deadly weapon. How’s that for encouragement to return? Oooh NICE yarn! I usually say “plumbing in” when referring to the service when you superglue the new vicar to the parish.